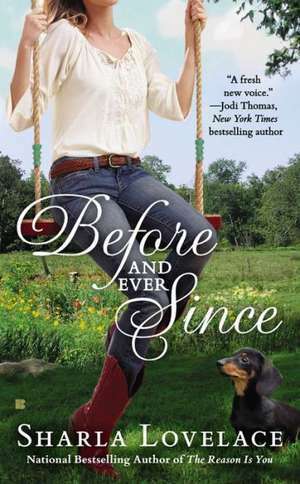 In this sparkling romance from Sharla Lovelace, the bestselling author of Just One Day and The Reason is You, a woman must confront the secrets of her past when the man she once loved returns to town after twenty years. For fans of Jodi Thomas and Lori Wilde. Twenty years later, Emily now has a successful career, a stubbornly independent grown daughter, an ex-husband who rarely tests her patience, and a mother who often does. But Emily also has a secret, one that she buried long ago and tried to forget. Then Ben returns, and any sense of normalcy in her life is gone. Seeing Ben does more than bring back memories. Visions of her past begin playing before her eyes and show every choice she made in a revealing new light and a startling new angle. For Emily, seeing her life in rewind makes her realize she has hard choices to make for her future—choices that could redefine everyone else’s future as well. Sharla Lovelace is the national bestselling author of The Reason Is You, Before and Ever Since, and the novella Just One Day. Being a Texas girl through and through, she’s proud to say she lives in Southeast Texas with her family, an old lady dog, and an aviary full of cockatiels. Sharla is available by Skype for book club meetings and chats, and loves connecting with her readers!